By Helen Banner. Directed by Jess Chayes. 1/12/2019 - 2/3/2019 a the New York Theater Workshop’s Next Door Series. 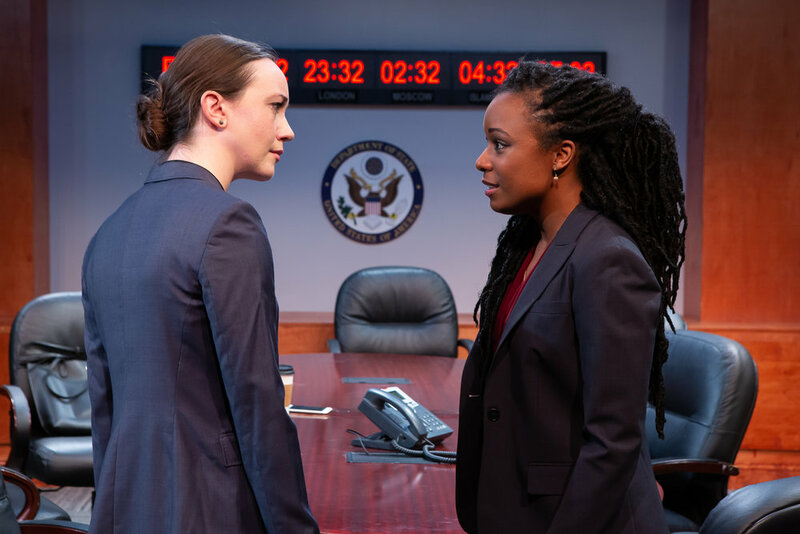 INTELLIGENCE is Helen Banner’s stunning new play debut, developed with and directed by Jess Chayes. Sarah MacIntyre, a presidential appointee parachuted into the Foreign Service, has been assigned two wary young diplomats to develop her pet project: New Training Scenarios for the Resolution of Intractable Global Situations. The three begin to role-play, led by a charismatic woman experienced in persuading men to lay down arms. INTELLIGENCE pulls the audience into a basement conference room in Washington, D.C., for an intense experience of how we code and decode others and ourselves through our imaginations. INTELLIGENCE received developmental support as part of the 2017 Artist Residency Program of The Drama League of New York, the New Georges JAM and the Nut Island Creative Colony on Governors Island. Rehearsal space provided by Creative Space, a program of ART/NY.